Do you need a quick and delicious meal in a hurry? Make my griddled lamb steaks with roasted aubergines, tomatoes and couscous. Quick enough for a midweek meal and super delicious. Post sponsored by Tasty Easy Lamb. I have been overdosing on festive recipes lately – and the majority of them have been cakes, chocolate and desserts. And I must confess that, on occasion, I have been so busy and so pressed for time that I have eaten said cakes for lunch. I was thrilled to take a break from all that and make griddled lamb with roasted aubergines, tomatoes and couscous for lunch today. Aubergines (eggplants) go really well with lamb and I had a few stashed in the fridge so I roasted them with a few cherry tomatoes and served everything over couscous. Adding chopped pistachios and pomegranate seeds just seemed so right and they add a beautiful colour and texture to the dish. 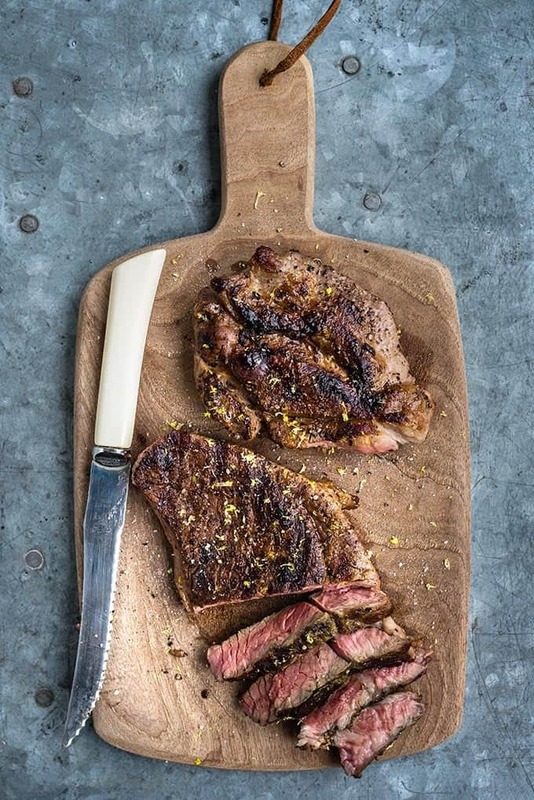 Lamb leg steaks are quite lean and cook really quickly – about 4 minutes total is usually enough for medium-rare which is the best way to serve them. Make sure your steaks are similar size and thickness so that they cook evenly. You could flatten them slightly using a rolling pin if they are of varying thickness. The only thing to remember is to take the meat out of the fridge 30 minutes before cooking and to let it rest after cooking for at least 5 minutes before slicing. Ground sumac is great for spicing up meat dishes and it goes especially well with any Middle Eastern or Mediterranean recipes. 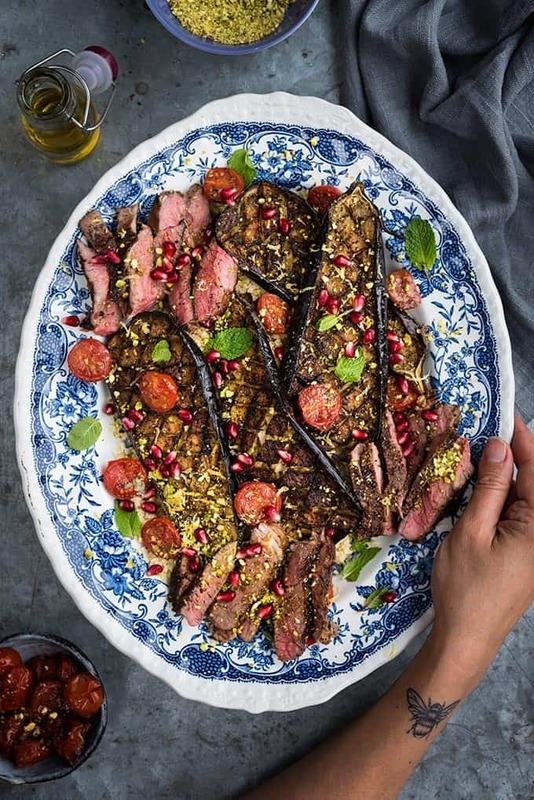 You can add it to salads or use it as spice rub for meat – here a sumac and olive oil marinade is used for both the lamb leg steaks and the roast aubergines. You could cook the lamb leg steaks and the aubergines on a BBQ as well – but right now we can only look forward to summertime. Still this recipe will bring a little sunshine to your table whatever the season. Do you need a quick and delicious meal in a hurry? Make my griddled lamb steaks with roasted aubergines, tomatoes and couscous. Drizzle with yoghurt dressing and scatter with pomegranate seeds and chopped pistachios for a colourful and delicious quick meal. Preheat the oven to 200C. Drizzle a large heavy tray with a little olive oil. Mix the olive oil, sumac and minced garlic together. This marinade will be used on both the lamb and the aubergines. Mix yoghurt, lemon juice, pomegranate molasses, minced garlic together. Add enough water to thin the dressing and salt, to taste. Cut the aubergines lengthwise into thick slices and cut a criss-crosss pattern on one side. If you are using small aubergines you can slice them in half lengthwise. Brush the aubergines with the oil marinade and roast, cut side up, in the oven for 20 minutes. Meanwhile rub a little of the oil marinade on the lamb steaks, sprinkle with the lemon zest and season with salt and pepper. Set aside. Add the sliced tomatoes to the tray of aubergines and drizzle with a little marinade. Season with liberally with salt and pepper and return to the oven for a further 10-15 minutes. While the tomatoes are roasting, put the couscous in a bowl and cover with the hot stock. Mix to combine, cover the bowl with a plate and set aside. Heat a griddle pan on the stove. Add the lamb steaks and cook for 2 minutes on each side for medium-rare and up to 3 minutes on each side for medium-well done. Leave the steaks to rest for 5 minutes while you assemble the rest of the dish. Fluff the couscous with a fork and spread over a large platter. Top with the roast aubergines and tomatoes. Slice the lamb steaks and add to the platter. Scatter the chopped pistachios, pomegranate seeds and mint leaves over the platter and then drizzle with the yoghurt dressing. My husband loves lamb and I am always looking for new ways to cook it. This looks delicious. What a gorgeous looking dinner! That lamb looks like it is cooked to perfection! I love adding pomegranate seeds for a pop of flavor and color! Sounds delicious ant the photography is stunning! This dish looks so tasty! I think lamb goes so well with aubergines and a few spices. This would be right up my street. Your photos are beautiful! I’ve been craving lamb recently, and have just purchased my first packet of sumac. Can’t wait to try this recipe over the holidays.